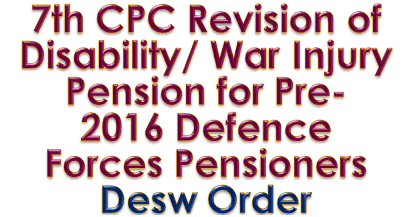 Subject- Implementation of Government decision on the recommendations of the 7th Central Pay Commission (CPC) - Revision of Disability/ War Injury pension for pre-1.1.2016 Defence Forces pensioners reg. The undersigned is directed to refer to this Ministry's letter No. 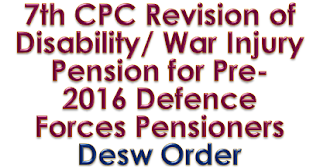 17(01)/2016-D(Pen/Pol) dated 29th October' 2016 modified vide letter No 17(01)/2017(01)/ D(Pension/Policy) dated 4th September, 2017 for revision of pension of pre-2016 Defence Forces pensioners/ family pensioners in implementation of the Government decisions on the recommendations of the 7th CPC. As per the same, disability element/ liberalized disability element/ war injury element of Defence Forces pensioners have been revised by the pension disbursing agencies by multiplying the existing rate of disability element as on 31.12.2015, by factor of 2.57 to arrive at revised rate of disability element as on 1.1.2016. The Ministry vide letter No 17(01)/2017(02)/D(Pension/Policy) dated 5th September, 2017 have also issued orders for revision of pension including disability element by issue of corrigendum PPO based on notional pay fixed as on 1.1.2016 in the 7th CPC pay matrix corresponding to the pay in the pay scale/ pay band 86 grade pay in which the pensioner had retired. The later order of 5th September, 2017 allows the benefit of broad banding of disability in cases of retirement/ discharge voluntary or otherwise with disability/war injury and additional pension on disability/war injury element to be authorized by issue of corrigendum PPO. 2. In partial modification of Ministry's said order dated 29th October, 2016 as modified, the President is now pleased to decide that in cases where Armed Forces pensioners who were retired/discharged voluntary or otherwise with disability and were in receipt of disability/war injury element as on 31.12.2015, their extent of disability shall be re-computed in the following manner before applying the multiplication factor of 2.57 on existing disability/war injury element to arrive at the revised disability element/ war injury element as on 1.1.2016. 3. Rates for calculation of disability where composite assessment has been made due to existence of disability as well as war injury, shall be determined in terms of provision contained in Para 3(b) of Ministry's letter No. 16(02)/2015-D(Pen/Pol) dated 8th August 2016. The amount of revised disability element finally arrived shall be rounded off to next higher rupee. 4. The President is also pleased to decide that quantum of additional pension available to old age pensioners after attaining the age of 80 years and above, shall also be admissible on revised disability/ war injury element. The Note below Para 12 of this Ministry's above mentioned letter dated 29th October, 2016 stands deleted. 5. The provisions of this Ministry's above-mentioned letter dated 29th October 2016 as modified vide letter dated 4th September, 2017 and dated 5th September, 2017, which are not affected by the provisions of this letter, shall remain unchanged. 6. PCDA(Pensions) Allahabad shall issue necessary implementation instructions for implementation of provisions of these orders directly by the Pension disbursing agencies. 8. This issues with the concurrence of Finance Division of this Ministry vide their ID No. Part file (i) to 30(01)/2016/Fin/Pen dated 15.12.2017.